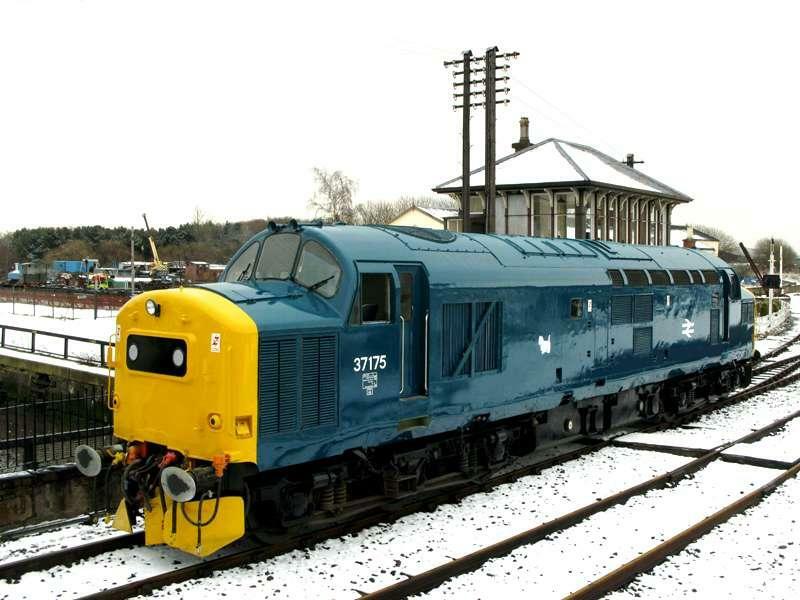 The Class 37s are 1750hp diesel locomotives and were built by English Electric between 1960 and 1965. Class 37s were first allocated to Scottish Region depots in 1966 and for the next 14 years were mostly used on freight trains in the Central belt. However, in the early 1970s, class 37s were occasionally used as substitutes for class 27s on the Edinburgh - Glasgow Push-pull service; air brake fitted locomotives being in short supply. During the early 1980s steam heat fitted examples replaced class 27s and class 26s on passenger trains on the West Highland and Far North Lines. As part of the general refurbishment program in the mid 1980s, thirty-one class members were additionally equipped with Electric Train Heating (ETH) equipment and renumbered in the 37/4 sub-class. This facilitated the end of steam heating, and brought to an end the use of ETHELs on the Fort William sleeper. The 37s were largely replaced on the West Highland and Far North Lines by class 156 DMUs in 1989, but continued to see use on Summer services into the mid 1990s, when they also featured on Inverness - Edinburgh / Aberdeen routes. From 1992 to 1995 pairs of class 37s (with a generator coach for ETH) were used on the Intercity Sleeper trains north of Edinburgh to Inverness and Aberdeen. At privatisation of BR, the majority of the Class 37 fleet passed to EWS, including all the Scottish based locos, then concentrated at Motherwell depot. The introduction by EWS of class 66 locomotives meant a drastic reduction in the requirement for class 37s on freight and engineers trains. 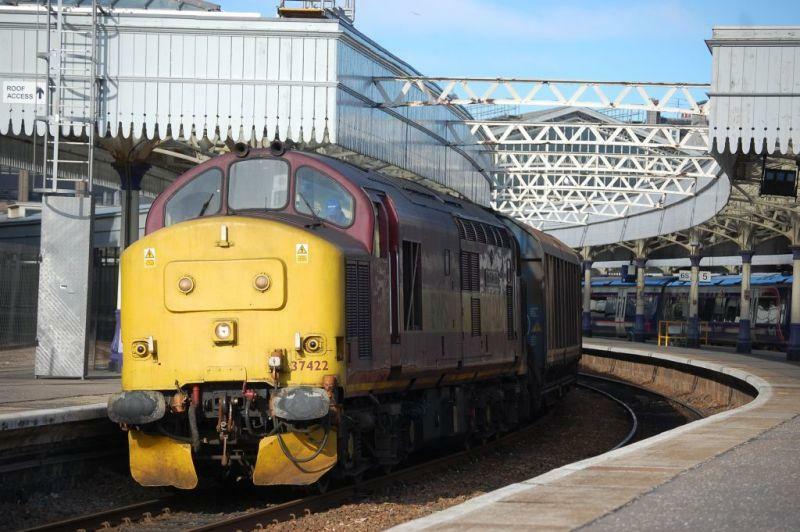 Class 37/4s continued to haul the Fort William portion of the Caledonian sleepers until replaced by class 67 locomotives in 2006. Today class 37's are mainly operated by Direct Rail services and West Coast Railway company with a few on preserved lines. DRS Class 37s used to make regular trips to Scotland on the Nuclear flask trains to Hunterston and Torness but until 2016/2017 these duties are now covered by Class 66s and the modern Class 68s. From the start of 2019 as part of a new FOC region agreement with Network Rail, DRS resumed duties on infrastructure test trains for Network Rail in Scotland after Colas Rail took over in 2015. DX: Deep Blue with Large Light Blue bodyside panel and Green DRS Compass logo branding. DU: Deep Blue with no branding at all (Unbranded). BL: British Rail Large Logo - Blue with Yellow cabs, Grey roof, large numbers and full bodyside height BR Logos. WCR:West Coast Railway Company - All over Maroon with Yellow ends and WCRC branding. The locomotives can see use on charter trains, particularly on routes not cleared for class 47s, such as Crianlarich to Oban. EPX: Europhoenix & Rail Ops branding +silver/grey colours with partial yellow ends. Two of these locos are relevant to Scotland: 37800 as well as 37884 see regular use on EMU drag duties for Scotrail in and out of Glasgow Works as well as Kilmarnock Wabtec Works. This is due to the fact they feature the appropriate coupler adapters for the easier movement of units. DB Schenker (formerly EWS) retained a small number of locomotives for use on engineering and charter trains to Oban, Mallaig, and Kyle where other DBS locomotives where not permitted to operate due to low Route Availability. They also seen use during the winter months on Snow Plough duties out-based at Inverness and Aberdeen, but reliability during 2009/10 was a major problem. The remaining operational locomotives were based at Toton, and when required in Scotland were usually moved north 'dead in train' on regular freight trains. As of 2011, DBS no longer own any 37/4s. they are now with DRS. 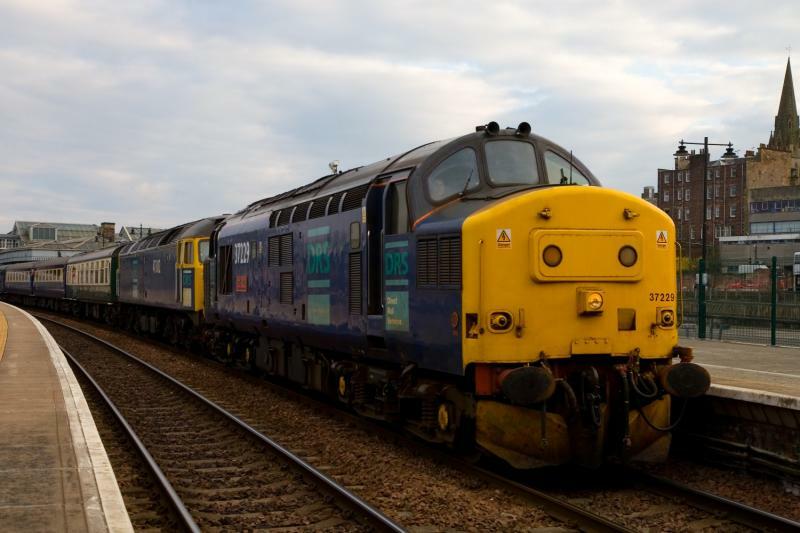 Scotland plays host to several preserved Class 37s. 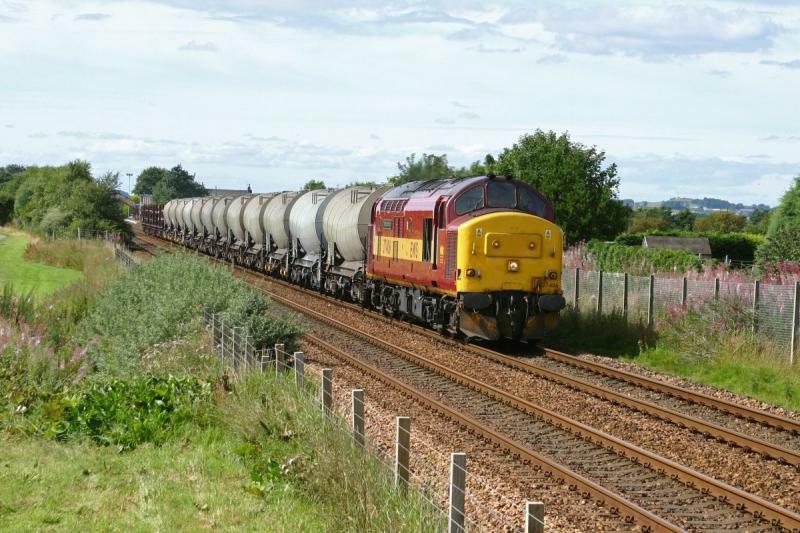 37097 is located at the Caledonian Railway (Brechin). It has been operational since 2006 and recently received a repaint into BR blue. It was named Old Fettercairn at the CR's 'Sulzerfest' diesel gala on the 6th of May 2007 - the name comes from a local distillery's brand of whisky. The Fettercairn distillery provided sponsorship for the restoration of the loco. 37175 is located at the Bo'ness & Kinneil Railway and after being purchased from EWS (now DB Schenker) in 2006 has recently been made operational. The locomotive deputised for the unavailable 37025 at the Keighley & Worth Valley Diesel Gala in June 2007, making its first passenger runs in preservation. It then moved to the East Lancs Railway for three months and arrived at Bo'ness in September 2007 in readiness for the diesel gala. It is now a resident loco at Bo'ness and is currently undergoing a full power unit overhaul and return to mainline certification. 37175 has now been sold to Colas Rail in 2014. Class 37 Locomotive Group. Featuring a comprehensive database. Scottish 37 Group. Owners of 37025. Created by brucekitchener and last modified by SC318250 at 22:18, 24 of March 2019.